A few weeks back, I spoke to a group of public servants about good HR private sector practices and how some of those people practices can help them to improve productivity in their departments, improve engagement of their staff and also to deliver greater value to the public. To begin, private sector companies that are well managed often get better results from their employees because employees have a strong relationship with their managers and clear communication from their managers. Employees need a manager who will provide a clear path for them, so they can concentrate on what they do best, and do more of it. They also need strong relationships with their co-workers to ensure there is team synergy. They must feel a commitment toward their co-workers and from them, because that commitment enables them to take risks and stretch for excellence. Unlike public sector managers, in the private sector, managers are required to challenge employees within their areas of talent, then help them to gain the skills and knowledge they need to build their talents into strengths. In addition, managers are required to help their employees to develop ownership of their goals, targets, and milestones, so employees can enhance their contributions to the company and increase their impact. On the other hand in the public sector there is no skills matching at all and goal setting is very poor. As a result the workforce in the public sector is largely disengaged. Why? Because employees know their potential is being wasted – that they don’t make full use of their talents and strengths in their role. For example, secretaries are assigned to ministries with no knowledge of the subject and they cannot fit into the role. Like we say in the private sector, they become a square peg in a round hole. Ministry secretaries must act like a CEO of a company and not like a glorified administration manager who has only mastered the FRs and the ARs. The appointing authority must finally take responsibility for putting the wrong person in the wrong place. Therefore, like the private sector, the public sector must set robust goals, meet and exceed expectations, and work enthusiastically toward the nearest tough task. The other bad practice I have seen in the public sector is that they leave their best employees alone. Great managers do just the opposite. Great managers spend most of their time with their most productive and talented employees because they have the most potential. If a manager coaxes an average performance from a below-average employee, she still has an average performer. But if she coaches a good employee to greatness, she gains a great performer. Go back to the basic principles. Start with expectations. Do the employees have clarity about their roles? Are they confused about what the Government and the public need them to contribute every day? Then make sure they have the right materials, equipment, and information to move towards those outcomes. Next, refocus on employees – on their skills, knowledge, and talents. Employees who get to do what they do best every day move toward improving performance. And last but not least, catch them doing things right. Recognise them for excellence. Recognition is personally fulfilling, but even more, recognition communicates what an organisation values, and it reinforces employee behaviours that reflect those values. Therefore secretaries as the chief executive officer must learn to set clear expectations, give their staff the right materials, focus on the employee, and recognise the best performers – those are the strategies that drive top performance in the private sector. Before a secretary assumes his duties, they must be made to take a course in HR for non HR to ensure they appreciate that all strategy is executed by people and that they need to be supported, trained and equipped to deliver. In the final analysis, it is the public service that implements the policies of the Government, therefore those people entrusted with running the Government need to spend some quality time to ensure the public servants are better motivated with performance rewards, based on a valid and all-inclusive performance evaluation system involving every ministry, department, unit and individual from the minister to the messenger. Many make the mistake that everything begins and ends with the President or Prime Minister. 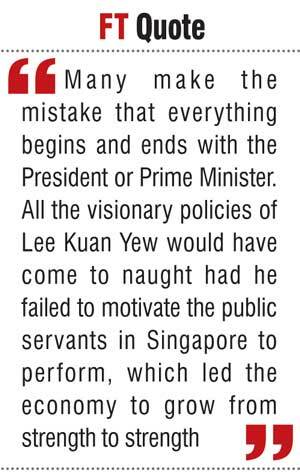 All the visionary policies of Lee Kuan Yew would have come to naught had he failed to motivate the public servants in Singapore to perform, which led the economy to grow from strength to strength.